Darkest grey: German Empire Note: The map uses the borders of the present-day, but the historical extent for German territories is depicted. 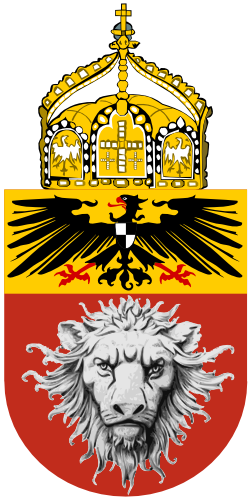 German East Africa (German: Deutsch-Ostafrika) was a German colony in the African Great Lakes region, which included what are now Burundi, Rwanda, and the mainland part of present Tanzania (formerly known as Tanganyika). Its area was 994,996 km2 (384,170 sq mi), nearly three times the area of present-day Germany. The colony was organized when the German military was called upon to put down a revolt against the activities of a mandate of the League of Nations. Like other powers, the Germans expanded their empire in the Africa Great Lakes region on the basis of fighting slavery and the slave trade. Unlike other imperial powers, however, they never actually formally abolished it, preferring instead to curtail the production of new "recruits" and regulate the extant slaving business. The colony began with Carl Peters, an adventurer who founded the Society for German Colonization and signed treaties with several native chieftains on the mainland opposite Zanzibar. On 3 March 1885, the German government announced it had granted an imperial charter (signed by Bismarck on 27 February 1885) to Peters' company and intended to establish a protectorate in the Africa Great Lakes region. Peters then recruited specialists, who began exploring south to the Rufiji River and north to Witu, near Lamu on the coast. When the Sultan of Zanzibar protested, since he claimed to be ruler on the mainland as well, chancellor Otto von Bismarck sent five warships, which arrived on 7 August 1885 and trained their guns on the Sultan's palace. The British and Germans agreed to divide the mainland between themselves, and the Sultan had no option but to agree. German rule was quickly established over Bagamoyo, Dar es Salaam, and Kilwa, even sending the caravans of Tom von Prince, Wilhelm Langheld, Emin Pasha, and Charles Stokes to dominate "the Street of Caravans". The Abushiri Revolt of 1888 was put down (with British help) the following year. In 1890, London and Berlin concluded the Heligoland-Zanzibar Treaty, returning Heligoland (seized during the Napoleonic wars) to Germany and deciding on the borders of German East Africa (the exact boundaries remained unsurveyed until 1910). Between 1891 and 1894, the Hehe tribe, led by Chief Mkwawa, resisted German expansion. They were defeated because rival tribes supported the Germans. After years of guerrilla warfare, Mkwawa himself was cornered and committed suicide in 1898. The Maji Maji Rebellion occurred in 1905 and was put down by the governor, Count Gustav Adolf von Götzen. But scandal soon followed, with stories of corruption and brutality, and in 1907 Chancellor Bülow appointed Bernhard Dernburg to reform the colonial administration. It became a model of colonial efficiency and commanded extraordinary loyalty among the natives during the First World War. German colonial administrators relied heavily on native chiefs to keep order and collect taxes. By 1 January 1914, aside from local police, military garrisons of Schutztruppen ("protective troops") at Dar es Salaam, Moshi, Iringa, and Mahenge numbered 110 German officers (including 42 medical officers), 126 non-commissioned officers, and 2,472 native enlisted men (Askaris). Paul von Lettow-Vorbeck (who had served in German South-West Africa as well as German Kamerun), was a successful general in German East Africa during World War I. Commerce and growth started in earnest under German direction. Early on it was realized that economic development would depend on reliable transportation. Over 100,000 acres (40,000 ha) were under sisal cultivation – the biggest cash crop. Two million coffee trees were planted and rubber trees grew on 200,000 acres (81,000 ha), along with large cotton plantations. To bring these agricultural products to market, beginning in 1888, the Usambara Railway, or Northern Railroad, was built from Tanga to Moshi, Tanzania. The longest line, the Central Railroad covered 775 miles (1,247 km) from Dar es Salaam to Morogoro, Tabora and Kigoma. The final link to the eastern shore of Lake Tanganyika had been completed in July 1914 and was cause for a huge and festive celebration in the capital with an agricultural fair and trade exhibition. Harbor facilities were built or improved with electrical cranes, with rail access and warehouses. Wharves were remodeled at Tanga, Bagamoyo and Lindi. In 1912 Dar es Salaam and Tanga received 356 freighters and passenger steamers and over 1,000 coastal ships and local trading vessels. By 1914, Dar es Salaam and the surrounding province had a population of 166,000, among them 10,490 (1,050 Europeans, 1,000 of them Germans. 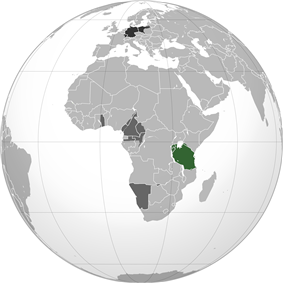 In all of the German East Africa were 3,579 Germans. In its own right, Dar es Salaam became the showcase city of all of tropical Africa. Gold mining in Tanzania in modern times dates back to the German colonial period, beginning with gold discoveries near Lake Victoria in 1894. The first gold mine in the colony was the Sekenke Gold Mine, which began operation in 1909 after gold was found there in 1907. Despite all these efforts, German East Africa never achieved a profit for the German Empire and needed to be subsidized by the Berlin treasury. Germany developed an educational program for Africans that involved elementary, secondary and vocational schools. "Instructor qualifications, curricula, textbooks, teaching materials, all met standards unmatched anywhere in tropical Africa." In 1924, ten years after the beginning of the First World War and six years into British rule, the visiting American Phelps-Stokes Commission reported: "In regards to schools, the Germans have accomplished marvels. Some time must elapse before education attains the standard it had reached under the Germans." One of the influences of this German development of education in their colony is the word "shule" (from "Schule" in German) that means school. Since Germans were the first colonialists to establish a solid educational program in the African Great Lakes region, the word "shule" has been borrowed into the Bantu Swahili language, the lingua franca of the African Great Lakes. 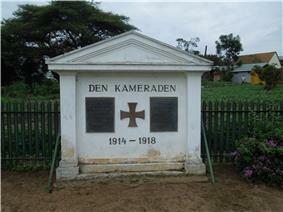 WW1 Memorial in Iringa, Tanzania. The story of German East Africa in the First World War is essentially the history of the colony's military commander, General Paul Emil von Lettow-Vorbeck. A vibrant officer, he spent the war harrying the forces of the British Empire, tying down with his band of 3,500 Europeans and 12,000 native askaris and porters, a British/Imperial army 40,000 strong, which was at times commanded by the former Second Boer War commander Jan Smuts. One of his greatest victories was at the Battle of Tanga (3–5 November 1914), where von Lettow-Vorbeck beat a British force more than eight times the size of his own. Lettow-Vorbeck was acclaimed after the war as one of Germany's heroes, and his Schutztruppe was celebrated as the only colonial German force in the First World War not to have been defeated in open combat (although they often retreated when outnumbered). The askari colonial troops that had fought in the East African campaign were later given pension payments by the Weimar Republic and the Federal Republic of Germany (West Germany). The German light cruiser SMS Königsberg also fought off the coast of the African Great Lakes region. She was eventually scuttled in the Rufiji delta in July 1915 after running low on coal and spare parts, and was subsequently blockaded and bombarded by the British. The surviving crew stripped out the remaining ship's guns and mounted them on gun carriages, before joining the land forces, adding considerably to their effectiveness. The Treaty of Versailles broke up the colony, giving the north-western area to Belgium as Ruanda-Urundi, the small Kionga Triangle south of the Rovuma River to Portugal to become part of Mozambique, and the remainder to Britain, which named it Tanganyika. as well as German translations of some local phrases, such as Kleinaruscha for Arusha-Chini and Neu-Moschi for the settlement that is now known as Moshi. Lake Eyasi was known as the "Hohenlohe Sea", and the mission town of Sankt-Michael (St. Michael) near Kahama was formerly more important. Historical map of the Coast of German East Africa, 1888. Historical map of German East Africa, 1892. Historical map of German East Africa, 1911. East African Theater in World War I.
Classroom in a German East African school, c. March 1914. The British, for some time after coming into possession of a major portion of German East Africa after World War I, did not abolish slavery in the former German colony until 1922, when it became the mandated territory of Tanganyika. ^ Originally an Arabic word for 'soldier' adopted from Osmanli, i.e. Ottoman Turkish, then applied to indigenous African troops in European colonies. ^ SS-Oberführer Julian Scherner was born here in Bagamoyo in 1895.